What's going on here, 30+ skiers (including other TAY folks) are up on the Muir Snowfield on Sunday, and nobody has bothered to write a trip report even a day-and-half later? At least I have an excuse, sleeping early after the trip and reawaking before dawn on Monday for jury duty. But I guess I'll go ahead now and write a belated report for the sake of posterity . . . Anyway, some of us who joined Sky in being a "drunken braggadocio in pubs around Seattle" decided to forego his subsequent quixotic adventures in the Mount Blum region. Instead, Griff and I headed for the whiter pastures of Old Reliable, the one and only Muir Snowfield, despite David's last-minute no-show due to "illness" (or could it have been the ominous drizzle at 6am in Seattle?). Well, the drizzle soon ended and the Mountain was eventually visible for much of the drive, sandwiched between broken low stratus and a misshapen crown of lenticulars. The Longmire gate was open well before 9am, so we cruised up to Paradise amid nearly-bare roadsides just in time for the sun to begin piercing the cloud deck. We skinned right from the car door across the snow-covered parking lot and soon broke out completely above the clouds within minutes. The next few hours up to Camp Muir were absolutely spectacular, sunny and warm with only the slightest breeze. Superb views of Mount Adams (with 2 stacks of lenticulars), Saint Helens (a major steam eruption in progress), Hood, and even Jefferson 150 miles to the south. 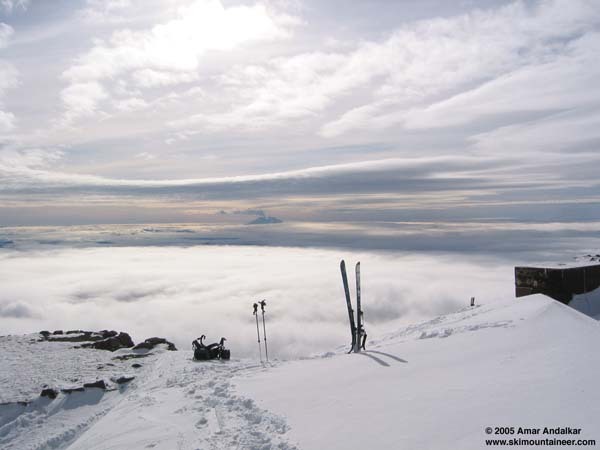 Rainier's summit was continuously swathed in various morphing lenticulars, but visibility was generally good to about 13000 ft (above Gibraltar Rock). The weekend's new snow was surprisingly deep from Glacier Vista (6300 ft) all the way to Muir, generally 4-8" of new snow covered most horizontal surfaces, although numerous (countless) rocks were exposed in the usual windblown areas near Pan Point and McClure Rock. This was an unexpectedly large amount of snow given that Paradise recorded only 2" new with less than 0.3" precip. We skied down from Camp Muir around 2pm, just as high clouds blocked the sun, temps dropped, and winds picked up. Snow conditions on the Muir Snowfield were generally dense powder, occasionally firmly wind-packed, but with no surface crust on the new snow. The new snow sat on the old, solid, icy, nubbly rain crust, which thankfully was very rarely exposed at the surface. Skiing was quite fun, but did require some effort and attention due to the varying density. We finally dropped down into the lower cloud deck just above Pan Point, and carefully skied through the myriad exposed rocks, following the summer trail through the cliffs. The ski from Glacier Vista back to Paradise was surprisingly fun, hundreds of footsteps had smoothed the dense wet new snow into a 10-ft wide groomed path atop the frozen crust, smooth and fast with almost no postholes. All in all, an excellent day which far exceeded our rather minimal expectations. The Pacific Northwest never ceases to amaze me, even during the worst winter in at least 24 years, you can still find 4700 vertical feet of continuous (and pretty good) skiing. You'd be hard pressed to match that even at Tahoe right now, despite their 12-15 ft deep snowpack! Mount Saint Helens emits a vigorous steam plume between the various cloud layers in the distance beyond Camp Muir. Click here for an enlarged version of this photo.